Geert, who heads Germany’s Hephata Klinik, serves as Associate Professor of Neurology at Philipps University, and lectures at conferences all over the world on the brain in sleep and dreaming, graciously sat down for a couple of hours of interviews on his expertise as it relates to CI’s work, particularly the experience of trance as a “waking dream” which especially intrigued him due to his interest in lucid dreaming states. We got out and about as well — Barbara, a cause-oriented, fine arts photography agent, took us to meet her colleagues at Santa Fe’s Photo-Eye Bookstore and Gallery. We visited several Canyon Road galleries, as well as her favorite artist at Santa Clara pueblo. We hiked and climbed the long ladders of Bandolier’s cliff dwelling, toured the Georgia OKeefe Museum, and saw the house and Ghost Ranch in Abiquiu. Rod, the author of “Baja Dreaming” found time to work on his second sailing memoir, a collection of poetry and short essays on his lifetime of adventuring at sea, which is now at the printers. Congrats Rod, and thank you Barbara for your kind words. 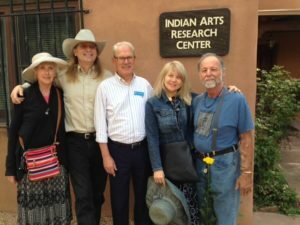 Paul and I joined Dori Smith and Steven Hecht for a tour of the extensive collection of historic pueblo ceramics and basketry at Santa Fe’s Indian Arts Research Center. A division of the School for Advanced Research (sarweb.org) its stated goal is to “bridge the divide between creativity and scholarship…. and illuminate the intersections of the social sciences, humanities, and the arts.” Scholars as well as artists come to study these collections. Our knowledgeable and entertaining guide was Larry Dalrymple, the author of “Indian Basketmakers of the Southwest: The Living Art and Fine Tradition”, whose commentary — about how a pot was made, how each pueblo had its unique “temper” — such as ground volcanic rock or sand — added to strengthen the clay, how family groups grew famous over generations for their innovations and designs, how the traditional method of firing was done, with surprisingly simple yet effective means, certainly added to their luster. 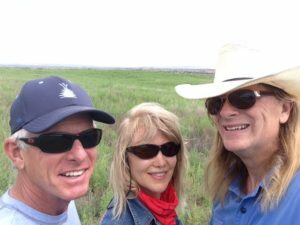 Mark Varien, archeologist and director of research at the Crow Canyon Archaeological Center (crowcanyon.org) stopped by to hike out to Cuyamungue’s ancestral village with us. Paul and I enjoyed a few days with landscape and nature photographer Kathy Crowe Finholm, visiting from Friday Harbor. 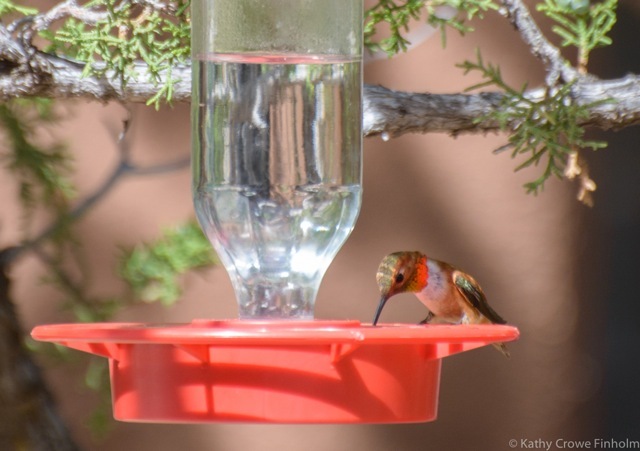 Kathy was soon staking out CI’s two new hummingbird feeders, and, referencing the Audubon and National Geographic Birds apps on her iPad, quickly identified an adult female Black-chinned and adult male Rufous (with red chin). She snapped these images using a telephoto lens so as not to disturb the birds. Kathy adds, “I enjoy the challenge of photographing these fast little fliers, and appreciate the tranquil surroundings of CI which made for a great opportunity.” Thank you Kathy for permission to use your photos of CI’s hummers. Paul spent a few days with David and Sherry Nighteagle at the Earthship home that David built at the base of Mesa Verde National Park. David, a noted flute player and maker, brought over thirty of his flutes to CI last year for a performance at CI’s Centennial last year and afterwards gave flute lessons. 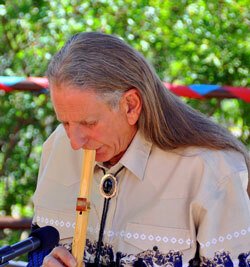 While an injury to his hands prompted him to stop making flutes, David still performs internationally, and locally at Crow Canyon and Mesa Verde (where his performances were enjoyed by Hillary Clinton and Laura Bush). Now a Interpretive Guide, he works a song or two into his tours of the cliff dwellings. Those who met Sundance last year will be happy to know this little wild pup has grown into a regular member of the Nighteagle clan. The Santa Fe Community Foundation does a wonderful job of providing educational support for the many non-profit organizations in Santa Fe. This summer, Paul and I attended their classes in Assessing the Financial Health of Your Non-Profit, and Archiving and Telling Your Story, at which we met a woman who had attended a CI workshop with Felicitas over a decade ago, and several others who expressed interest in coming out for a tour. We also attended a copyright and trademark class. May Hsi –Your photography of CI, most especially the Casita under the arms of the Milky Way, are stunning. Thank you for permission to use your images, and for your donation of several large high-quality prints, now available in the bookstore. To Janet Johnson — Your gift of the new hummingbird feeders has been very well received, by the hummers, and by those cleaning and refilling them — so much easier now! Sarah Smith — The two new sturdy, easy-to-store cots for sleeping out on the porch of the Kachina Lodge are very much appreciated. And thank you for the two books, “The Girl Who Sang to the Buffalo” by Kent Nerburn, and — especially for me, as I am a fan of David Lewis-Williams and this book was on my reading list — “The Mind in the Cave” on the European cave art of the Ice Age. 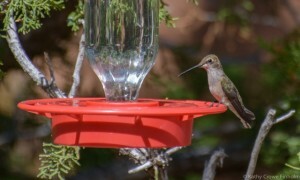 Geert Mayer — Your prayer flags have dressed up the Hummingbird Lodge and made it more special. And thank you for the insights and hours of interviews on the neurology and inner workings of the brain. Sherry And David Nighteagle – Provided eight nightstands for our student sleeping spaces. Alan Drobnak — Your professional quality tripod has been just the thing to get those group shots at the end of every workshop, thanks. Kim Miller — Your generous check and on-going support, your understanding of this work and attendance, means so much to us. Barbara Hand Clow — Your ongoing support over the years has been a big part of the foundation upon which we have accomplished so much. Thank you for your very generous check towards the purchase of the additional adjacent acreage. The Lester & Bernice Smith Foundation and Alex Smith — Without your support over the last five years, we could not have gone forward. Your early generosity made possible the renovation of the facilities, and with your recent support we are moving forward on several educational projects. Your support means the world to us. B and Rod, and Geert Mayer visit — I will email them all, since B reads the newsletter, and tell her this is a new column, and that next issue I will cover their visit here, will give us time to pull it together. we went to bandolier, georgia okeefe museum, bookstore, canyon road galleries….